Note: While the diagrams above show typical markings, they serve only as examples. The format and content of the engraved specifications will vary between objectives and manufacturers. Thorlabs offers several types of objectives to meet a variety of experimental needs. This guide describes the features and benefits of each type of objective. This designation refers to the medium that should be present between the front of the objective and the cover glass of the microscope slide. Dry objectives are designed to work best with an air gap between the objective and the specimen. Oil-immersion objectives require the use of a drop of immersion oil (such as MOIL-30) between and in contact with the front lens of the objective and the cover glass. Oil immersion is required in order to achieve numerical apertures greater than 1.0. Water-immersion (coverslip) objectives are designed to work best with a drop of water between the objective and specimen, while water-dipping objectives are designed to interface directly with the specimen. Note that if an immersion or dipping objective is used without the immersion medium present, the image quality will be very low. "Plan" designates that these objectives produce a flat image across the field of view. "Achromat" refers to the correction for chromatic aberration featured in the lens design. These objectives have chromatic aberration correction for two wavelengths and spherical aberration correction at one wavelength. Plan achromats produce their best images for green light. Apochromat objectives have chromatic aberration correction for three to five wavelengths and spherical aberration correction at two to four wavelengths. In white light, the plan achromats give satisfactory images for color photomicrography, but the results are not as good as objectives that feature better correction, such as plan apochromats or the plan fluorite objectives below. Plan fluorite objectives, also referred to as plan semi-apochromats, plan fluorescence objectives, or plan fluors, also produce a flat image across the field of view. Plan fluorite objectives are corrected for chromatic aberrations at two to four wavelengths and spherical aberrations at three to four wavelengths. In addition to being corrected for more wavelengths, plan fluorite objectives generally offer reduced aberrations between the design wavelengths relative to plan achromats. These objectives also work well for color photomicrography. Thorlabs' super apochromat objectives feature axial color correction throughout the visible range. They are designed to provide diffraction-limited axial color performance over a wide field of view with no vignetting over the entire field. The high NA of the super apochromatic design makes them ideal for widefield imaging and light-starved environments. Also referred to as the parfocal distance, this is the length from the top of the objective (at the base of the mounting thread) to the bottom of the cover glass (or top of the specimen in the case of objectives that are intended to be used without a cover glass). Parfocal length is not the same from manufacturer to manufacturer or even within the same manufacturer. For instance, Thorlabs manufactures objectives with 60 mm and 95 mm parfocal lengths, many Olympus and Zeiss objectives have a parfocal length of 45 mm, and the standard for Nikon and Leica objectives is 60 mm. Furthermore, some manufacturers also offer oversized objectives with a 75 mm parfocal length. For instances in which objectives with different parfocal lengths must be used, parfocal length extenders are available. This is the distance between the front element of the objective and the closest surface of the coverslip or specimen, depending on the design of the objective. The cover glass thickness specification engraved on the objective designates whether a cover glass should be used. This graph shows the effect of a cover slip on image quality at 632.8 nm. A typical coverslip (cover glass) is designed to be 0.17 mm thick, but due to variance in the manufacturing process the actual thickness may be different. The correction collar present on select objectives is used to compensate for coverslips of different thickness by adjusting the relative position of internal optical elements. Note that many objectives do not have a variable coverslip correction (for example, an objective could be designed for use with only a standard 0.17 mm thick coverglass), in which case the objectives have no correction collar. The graph to the right shows the magnitude of spherical aberration versus the thickness of the coverslip used, for 632.8 nm light. For the typical coverslip thickness of 0.17 mm, the spherical aberration caused by the coverslip does not exceed the diffraction-limited aberration for objectives with NA up to 0.40. When viewing an image with a camera, the system magnification is the product of the objective and camera tube magnifications. When viewing an image with trinoculars, the system magnification is the product of the objective and eyepiece magnifications. The rows highlighted in green denote manufacturers that do not use f = 200 mm tube lenses. The magnification of a system is the multiplicative product of the magnification of each optical element in the system. Optical elements that produce magnification include objectives, camera tubes, and trinocular eyepieces, as shown in the drawing to the right. It is important to note that the magnification quoted in these products' specifications is usually only valid when all optical elements are made by the same manufacturer. If this is not the case, then the magnification of the system can still be calculated, but an effective objective magnification should be calculated first, as described below. To adapt the examples shown here to your own microscope, please use our Magnification and FOV Calculator, which is available for download by clicking on the red button above. Note the calculator is an Excel spreadsheet that uses macros. In order to use the calculator, macros must be enabled. To enable macros, click the "Enable Content" button in the yellow message bar upon opening the file. 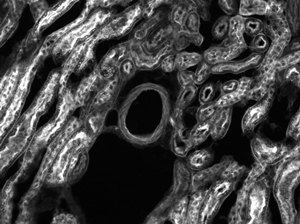 When imaging a sample with a camera, the image is magnified by the objective and the camera tube. If using a 20X Nikon objective and a 0.75X Nikon camera tube, then the image at the camera has 20X × 0.75X = 15X magnification. When imaging a sample through trinoculars, the image is magnified by the objective and the eyepieces in the trinoculars. If using a 20X Nikon objective and Nikon trinoculars with 10X eyepieces, then the image at the eyepieces has 20X × 10X = 200X magnification. Note that the image at the eyepieces does not pass through the camera tube, as shown by the drawing to the right. Magnification is not a fundamental value: it is a derived value, calculated by assuming a specific tube lens focal length. Each microscope manufacturer has adopted a different focal length for their tube lens, as shown by the table to the right. Hence, when combining optical elements from different manufacturers, it is necessary to calculate an effective magnification for the objective, which is then used to calculate the magnification of the system. Here, the Design Magnification is the magnification printed on the objective, fTube Lens in Microscope is the focal length of the tube lens in the microscope you are using, and fDesign Tube Lens of Objective is the tube lens focal length that the objective manufacturer used to calculate the Design Magnification. These focal lengths are given by the table to the right. Note that Leica, Mitutoyo, Nikon, and Thorlabs use the same tube lens focal length; if combining elements from any of these manufacturers, no conversion is needed. Once the effective objective magnification is calculated, the magnification of the system can be calculated as before. 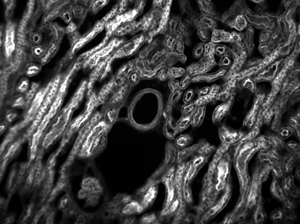 When imaging a sample through trinoculars, the image is magnified by the objective and the eyepieces in the trinoculars. This example will use a 20X Olympus objective and Nikon trinoculars with 10X eyepieces. The effective magnification of the Olympus objective is 22.2X and the trinoculars have 10X eyepieces, so the image at the eyepieces has 22.2X × 10X = 222X magnification. When imaging a sample with a camera, the dimensions of the sample area are determined by the dimensions of the camera sensor and the system magnification, as shown by Equation 2. The camera sensor dimensions can be obtained from the manufacturer, while the system magnification is the multiplicative product of the objective magnification and the camera tube magnification (see Example 1). If needed, the objective magnification can be adjusted as shown in Example 3. As the magnification increases, the resolution improves, but the field of view also decreases. The dependence of the field of view on magnification is shown in the schematic to the right. The images of a mouse kidney below were all acquired using the same objective and the same camera. However, the camera tubes used were different. Read from left to right, they demonstrate that decreasing the camera tube magnification enlarges the field of view at the expense of the size of the details in the image. Scan lenses are used in a variety of laser imaging systems, including confocal laser scanning microscopy, optical coherence tomography (OCT), and multiphoton imaging systems. In these applications, a laser beam incident on the back aperture (entrance pupil) of the lens is scanned through a range of angles. This translates the position of the spot formed in the image plane across the lens' field of view. In the case of non-telecentric lenses, this approach to scanning the focal spot through the image plane would introduce severe aberrations that would significantly degrade the quality of the resulting image. Telecentric scan lenses are designed to create a uniform spot size in the image plane at every scan position, which allows a high-quality image of the sample to be formed. Plots showing the spot size and scan position as a function of scan angle are included in the Specs tab. In general, laser scanning microscopy systems pair a scan lens with a tube lens to create an infinity-corrected optical system. However, most OCT systems are designed to use the scan lens without a tube lens. The CLS-SL, SL50-CLS2, SL50-2P2, and SL50-3P lenses were optimized for use in Thorlabs' confocal laser scanning and multiphoton microscopy systems, and the LSM family of lenses were optimized to be used in OCT imaging systems. A brief discussion of scanning systems implemented with and without tube lenses follows. The tube and scan lens schematic above shows the lens spacing for the SL50-2P2 scan lens used with a 200 mm focal length telecentric tube lens. Note that for the SL50-CLS2, the entrance pupil at the scan plane is a maximum of Ø4 mm. The image to the right shows the proper spacing of the scan and tube lenses for laser scanning microscopy. The scanning mirror, which is located at the left of the image at the scan plane, directs the laser beam through the scan lens. The angle at which the laser beam is incident on the scan lens determines the position of the focal spot in the intermediate image plane, which is located between the scan lens and the ITL200 tube lens. The tube lens is positioned so that it collects and collimates the light (the focus is at infinity). The collimated light is collected by the objective, which brings it to a focus on the sample plane. Light scattered or emitted from the sample plane is collected by the objective and directed to a detector. The image below and to the left shows a CLS-SL scan lens paired with a tube lens; clicking on the image shows the correct spacing for using the CLS-SL with the ITL200 tube lens. An attractive feature of this optical system design is the collimated light that is produced as a result of pairing the scan lens with the tube lens. With the light from the tube lens focusing at infinity, it is possible to move the position of the objective with respect to the tube lens without impacting the image quality at the sample plane. This imparts considerable flexibility to the design of the optical system. 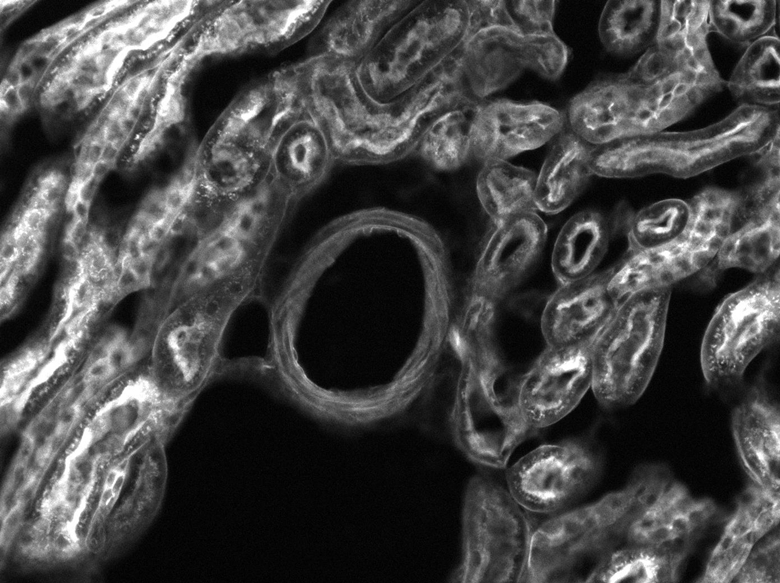 If no tube lens were used, the scan lens would also function as the objective and the intermediate image plane would become the sample plane. It would not be possible to move the image plane much with respect to the scan lens while maintaining image quality. The image below and to the right shows the relationship between the scan distance and the objective distance. In a perfect 4f optical system (using the CLS-SL as an example), d1 = 52 mm (minimum scan distance) and d2 = f2. However, in many practical cases the system is slightly deviated from this perfect alignment. For instance, in many commercial microscopes, the objective distance (d2) is not the same as the focal length (f2), so there may be a need to adjust distances. The figure below and to the right shows the scan and objective distance moved by some small distance δ1 and δ2, respectively. The relationship between these values is δd1 = -δd2*(f1/f2)2. CLS-SL Tube Lens integration with the ITL200 and an objective in a laser scanning system. A diagram showing lens placement for a general laser scanning system. When designing an imaging system that uses an LSM scan lens in an OCT configuration, it is important to accommodate the design wavelength, parfocal distance, scanning distance, entrance pupil, and scan angle specifications in order to maximize the image quality (see the Specs tab for scan lens specifications and definitions). In general, the larger the input beam diameter, the smaller the focused spot size. However, due to the effects of vignetting and/or increased aberrations, the range of scan angles decreases as the diameter of the beam increases. Beams smaller than the entrance pupil specification will result in spot sizes larger than those specified in the Specs tab, and beams with larger diameters will be clipped. For imaging systems with a single galvo mirror the center of the scan lens' entrance pupil is coincident with the pivot point of the galvo mirror. 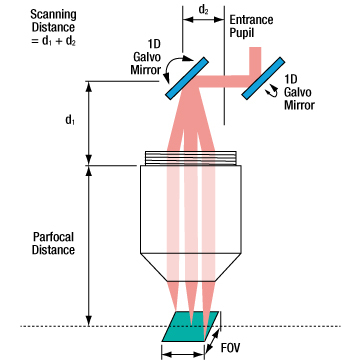 When a single galvo mirror is used, the scanning distance is measured from the mounting surface of the lens to the pivot point of the mirror. This is shown in the image at bottom-left. If the imaging system uses two galvo mirrors (one to scan in the X direction and one to scan in the Y direction), the entrance pupil is located between the two galvo mirrors, as is shown in the image at bottom-right. The scanning distance is then the distance from the mounting surface of the lens to the pivot point of the mirror closest to the lens (d1) plus the distance from the pivot point of that mirror to the entrance pupil (d2). It is important to minimize the distance between the two galvo mirrors, because when the entrance pupil and beam steering pivot point are not coincident, the quality of the image is degraded. This is principally due to the variation in the optical path length as the beam is scanned over the sample. Below are schematics for an imaging system containing one and two galvo mirrors. at the pivot point of the mirror. 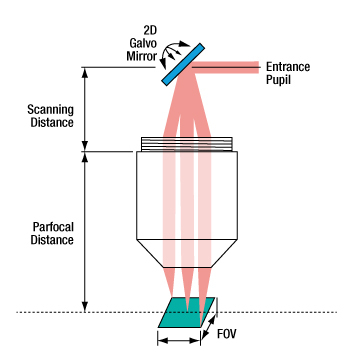 When two galvo mirrors are used, the entrance pupil is located between the mirrors.